Rebecca Louis, 18 yrs. 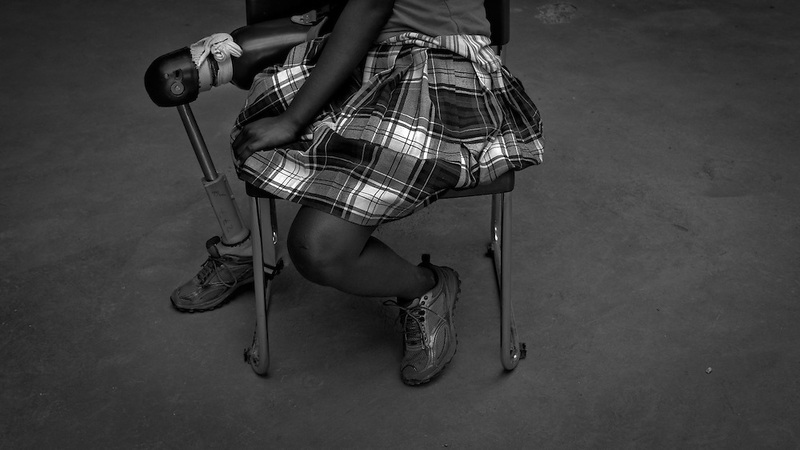 lost her right leg from the earthquake, rests during physical therapy at Healing Hands Haiti Clinic. Healing Hands Haiti (HHH) in Port Au Prince has been established for 12 years since 1999. Currently, HHH is constructing a new facility in Port Au Prince because their old clinic was destroyed from the earthquake. HHH provides physical therapy, counseling, prosthetics, and support for free or very little cost to Haitians. Their funding comes from private donations and organizations such as Handicap International, Mission Europeene Aide Humanitarian, International Committee of the Red Cross (ICRC), American Red Cross, Newman's Own, Direct Relief International (DRI), SOROS Open Society Foundation, and USAID which pays for employees, doctors, supplies, and facilities. The motto of HHH is "to serve the people of Haiti is to enable them to help themselves." Thus, most of their employees are Haitians with very few foreign expats. Furthermore, HHH recruits and teaches young Haitian students prosthetic and orthotic skills and physical therapy in a specialized program that will enable them to earn a degree approved by World Health Organization.